For the pro or the beginner, this guide is completely spillproof and perfect for your kitchen. Pocket 4" x 6" bi-fold version of our Joints & Ligaments laminated reference guide. Full 8.5" x 11" version available. 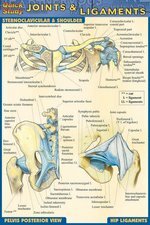 Complete, labeled illustrations of joints and ligaments in the human body. From pre-teen to pre-med, this chart is loaded with beautifully illustrated diagrams, clearly and concisely labeled for easy identification. Pocket 4" x 6" bi-fold version of our Anatomy laminated reference guide. Full 8.5" x 11" version available. 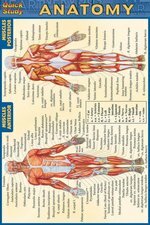 Pocket 4" x 6" bi-fold version of our Muscular System laminated reference guide. Full 8.5" x 11" version available. 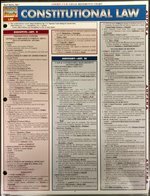 Pocket 4" x 6" bi-fold version of our Nursing laminated reference guide. Full 8.5" x 11" version available. 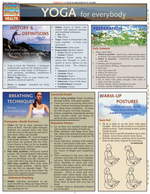 Includes tables and diagrams labeled and organized for quick reference. 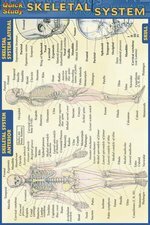 Pocket 4" x 6" bi-fold version of our Skeletal System laminated reference guide. Full 8.5" x 11" version available. 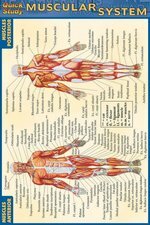 Powerful human anatomy desktop easel reference in 21 pages with more detailed illustrations and labeled parts per page than any other reference tool. Pages are laminated, making them rip and spill-proof and are spiral bound with an easel-stand making this a desktop reference that stands tall on your desk for hands-free reading. Simply flip pages to find the system you need to reference. Beautifully illustrated by award-winning anatomical artist Vincent Perez. There is no other source that offers this much anatomical reference in this amount of space and for this price. With a built-in easel this reference tool can stand upright on your desktop workspace for true at-a-glance quick reference. Twenty-one durable laminated pages that cover more facts per page than any book so you can get the most out of your software tools for home, school or business. The hard cardboard backing folds to lay very flat for portability and storage.